I’m delighted to write that I have not posted a blog simply because I have been too busy living my life. Over the next few days I hope to rectify the lack of communication by playing catch-up. I may as well start with my last scan—being presented here in unadulterated fashion. 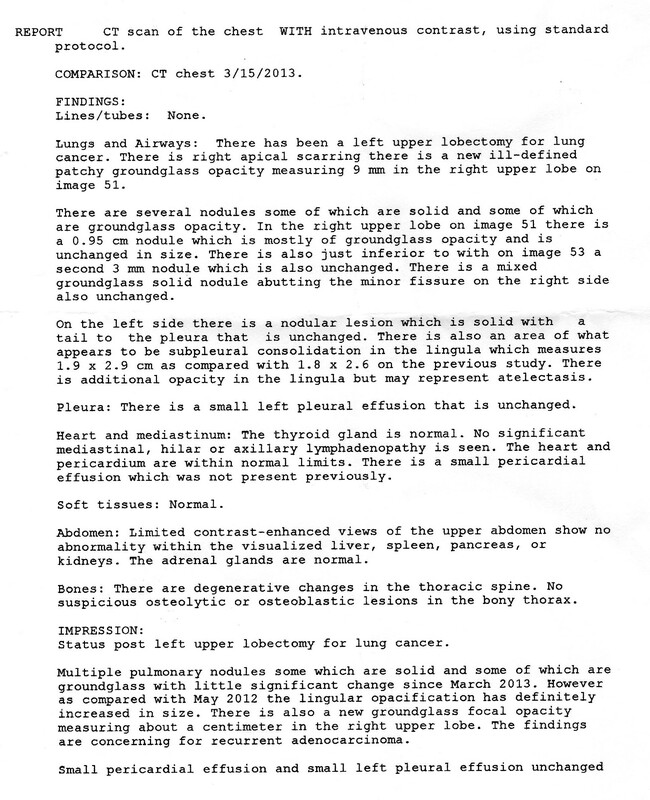 Couple of notes; for the uninitiated, ground glass refers to patchy or lace-like areas which represent some form of inflammation and/or cancer. We always hope for the former, but in my case, it is likely the latter. Also, the pericardial effusion is not actually new—but rather has been noted for some time, as has the pleural effusion: no biggie. As for what this all means; in short I continue to have progression. Not marked, but Dr. Shaw felt ‘little significant change’ was not quite adequate either. However, as I am tolerating the alimta and feel pretty well overall followed by one week of feeling just about fabulous, there is no discussion about changing up therapies yet. Also noted at my appointment was the fact that I have gained fifteen pounds in four months. I was pretty skinny coming into chemotherapy, so this is a good thing. However, at least some of the weight is due to steroids, and therefore not evenly distributed. I’ve got a bit of moon face going on, and my fingers and toes are sorta chubby—merely enhancing my resemblance to a big baby (more about that later).